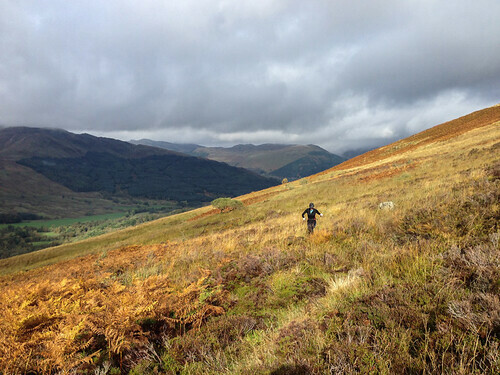 The Trossachs offer some excellent longer runs with a properly remote feel beyond the usual and well trodden routes and walkers paths. 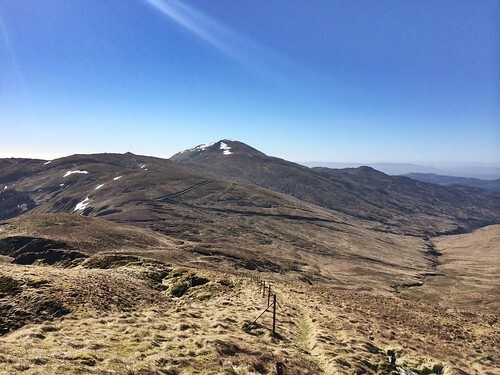 I have been meaning to write up notes on some of the running possibilities in the Trossachs back country for a while – this is a start. Instead of starting from the busy Stank Road car park as the walkers do, I prefer the Bochastle car park on A821 not far after Laid Inn. Not only it is always quiet, but the pleasant 3km jog along Sustrans route 7 provides a gentle warm up before the steady climb up Ben Ledi that starts directly from the Stank Road parking. As you cross the stream at NN 574 091, be aware this is the only good water source for the next 15km or so; there is a fair bit of stationary water along the way, but clean running water can be surprisingly hard to locate (I confess, I carry chlorine tablets for emergencies after I got caught out on this very run on a hot summers day couple of years back). From Ben Ledi summit follow the walkers path along the obvious ridge N and NW into the bealach above Stank Glen, then continue along the fence line past Lochan nan Corp. The old fence goes all the way to Benvane, making navigation straight forward. The faint path along it provides the best running ground; stick to it, only leaving it around 30 or so vertical meters below the summit (another faint path). 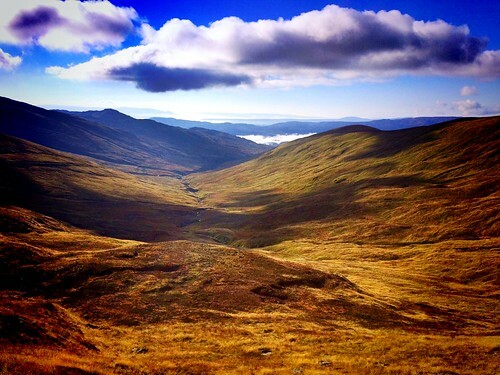 Retrace you steps past Lochan nan Corp, then pick up the walkers path down Stank Glen. This is by no means an inferior option, the running is again superb in reverse, and the lower Stank Glen path offers excellent fun. Follow the NNW ridge of Benvane toward Glen Buckie. The running is, again, excellent, on a faint path. At around NN 525 159 the path turns NE following the ‘ridge’ line clearly visible on the map, passing NW of the small patch of trees, exiting on the farm track at the bridge; enjoyable, fast, descent. Take the track to Immeroin, then follow the path sign posted for Strathyre, sparsely waymarked by wooden poles. When on the flat ridge, follow the path, which crosses a fence at a fancy metal gate (Victorian?). Continue on the path departing perpendicular from the fence, then curving gradually left (N) through younger trees until exiting on a good track in the deforested area above Strathyre. Take the track down, then return along route 7 back to start.